Everyone loves a good quality schnitty. It’s a classic meal – you simply can’t go wrong. Well buckle up schnitty lovers, we’ve got two words for you: Loaded Schnitzels. That’s right, your fave meal just got an upgrade courtesy of Australia’s most-loved Bavarian restaurant Munich Brauhaus. Each golden-crumbed chicken schnitzel ($30) is generously smothered, covered and loaded with toppings and sauces, creating quirky fusions of some of the world’s favourite dishes and flavour combinations. These fabulous feasts are like having two meals in one. The Italian bursts with Mediterranean flavours of Napoli sauce, mozzarella, pepperoni, cherry tomatoes, olives and basil. 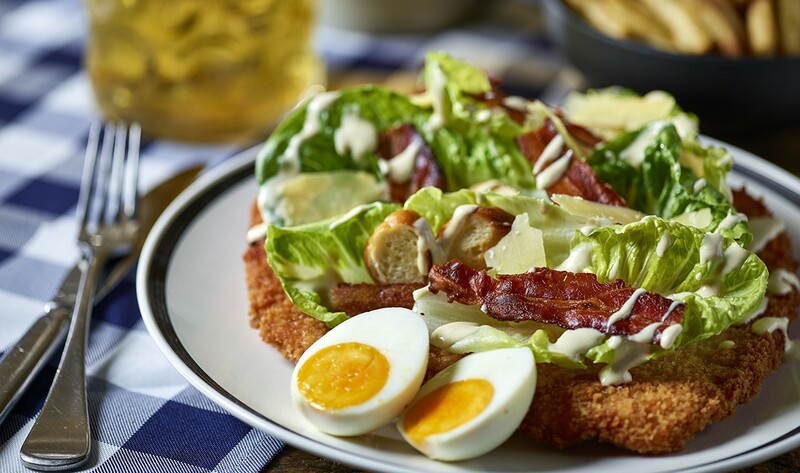 Can’t decide whether to have a schnitty or a salad? Have both with The Caesar, which is piled with cos lettuce, smoked bacon, parmesan, Caesar dressing, pretzel croutons and a slow-cooked egg. A first glance, you don’t think much of this but I promise you, this one is so damn good! Wavering between an Italian meal or a classic Bavarian dish? The Meatball covers ticks both boxes, boasting spaghetti, house-made meatballs in Napoli sauce, parmesan and basil, while the Texan is supersized with fries, mozzarella, smoked bacon, jalapeños, sweet BBQ sauce and creamy ranch dressing. The last of these five great schnitzels is The Mexican, which is back by popular demand, and features corn chips, chilli con carne, Jack cheese, fresh-pounded guacamole and sour cream. They sound pretty damn tasty right?? That’s not all though. If you are feeling up for a challenge (or just to prove that you’re the schnitty King (or Queen) they are also offering The Schnitzelmeister ($80) – a 1kg, six-stack, chicken schnitzel tower topped with Napoli sauce, ham and cheese and served with four side dishes. How much is your mouth watering right now?! Better yet, if you can finish The Schnitzelmeister (including all side dishes) in under one hour and receive it for free. Might sound easy, but we tackled this delicious bad boy on Monday and all I can say is skip lunch and wear your stretchy pants. Because these guys are the gift that just keeps on giving, they’ve also got a prize of $2000 is up for grabs at each Bavarian restaurant. To enter, guests must purchase a Loaded Schnitzel and either a 500ml, or 1-litre stein of beer. Winners will be drawn on Sunday, 31 March. Yahhooo, get to it. You will want to get around these meals STAT. Check it out here. Munich Brauhaus Melbourne is located at 45 S Wharf Promenade, South Wharf.